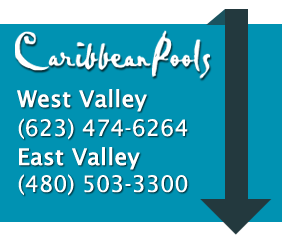 Caribbean Pools has been designing and building swimming pools, spas, and waterfalls in AZ for 20 years. In that time, we have built a reputation for quality products, friendly customer service, and competitive pricing. When you contact us for your new pool construction or pool renovation needs, you can expect expert service along with the most experienced technicians in the pool construction field. We will help you every step of the way from your free in-home assessment to the completion of your project. We utilize only the highest quality parts and equipment, giving you the assurance that your new pool construction will be built to last. Whether you are looking for a complete swimming pool and spa to be built from scratch, a new water feature such as a waterfall, or swimming pool renovations, Caribbean Pools is the company to call! Let Caribbean Pools take all the stress out of turning your backyard into a place you and the entire family can enjoy every summer. We are more than just a custom swimming pool builder, we design your dreams. Let our team come to your house and sit down with you to discuss ideas and build your perfect backyard. Give us a call or contact us today for Swimming Pool Services in Arizona!